Windows PC Aid is the PUP that uses misleading techniques to prevent removal. Use Reimage to locate malicious components and get rid of them faster than with uninstall instructions. A full system scan blocks virus reappearance and prevents traffic to malicious domains. How does Windows PC Aid works? Windows PC Aid is a rogue anti-spyware program that is being distributed via spam and infected websites. 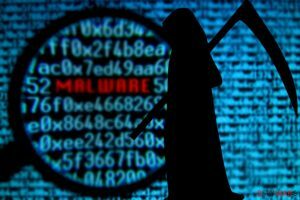 Infected websites usually redirect users to fake virus scanners and prompt them to install antivirus software to remove found malware infections. If you were redirected to a fake online virus scanner simply close the web page and do not download anything. At this point you are not infected with a rogue anti-spyware program. However, sometimes, scammers use drive-by downloads to install malware like Windows PC Aid without users' knowledge. In such case, the rogue program pop-ups on the computer screen after ten minutes or so. Users usually do not understand where it came from. It probably was and infected website or malicious advertisement placed on one of your favorite websites. 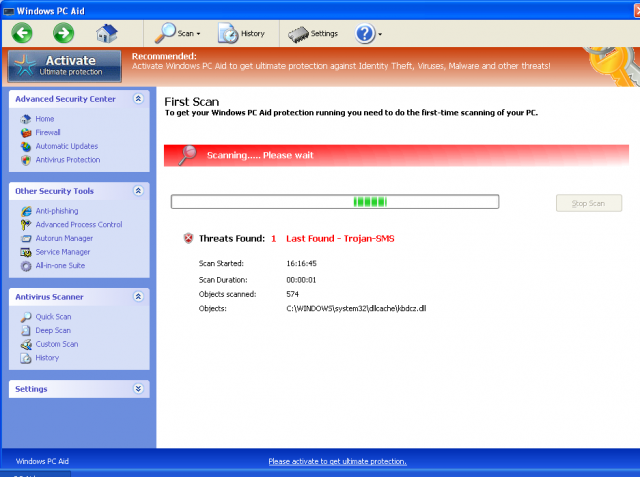 Once installed, Windows PC Aid will scan your computer for viruses. By saying 'scan' I mean that it just pretends to scan your PC and it can be even compared to the real antivirus scan since the rogue program simply displays the same infections on infected computes, the list of infections is coded into the program itself, so obviously it will report the same infections even on different PCs. Very often, it reports about 20 infections and more. In some cases, it pretends to remove one or more supposedly found infections for free and then prompts you to pay for a full version of the program to remove the rest of reported malware. Do not buy it! It's a scam that wants to steal money from you. While running, Windows PC Aid will display numerous fake security alerts and various notifications from Windows task bar saying that your computer is infected by malware, mostly trojans and spyware. The rogue program has a limited number of well-made but fake security alerts to scare users into believing that they are infected. Some people may actually trust them since they look realistic as hell. Another very annoying thing about this malware is the fact that it blocks legitimate programs. Just like any other fake antivirus virus program, it blocks task manager, registry editor and some other system tools to protect itself from being removed. You may not even use your web browser since Windows PC Aid blocks web browsers too. You might be able to open but it either will block certain websites or redirect you to infected or misleading websites full of advertisements and bogus software. If your web browser redirects you to survey sites and asks you to fill in certain forms given your full name, email address and phone number, close such websites immediately. You should uninstall Windows PC Aid as soon as notice its symptoms on ones PC. If you can't use your web browser properly and download malware removal software, please reboot your PC in safe mode with networking and try downloading anti-malware programs from this mode. If you can't connect to the Internet, check your LAN settings and make sure that you are not using a proxy server to access the net. If you have already purchased the rogue program, contact your credit card company and dispute the charges. If you are lucky enough you should be able to get your money back. Just tell them that you bought malicious software that pretended to be a Microsoft product. The most important part – Windows PC Aid removal. The best way to remove Windows PC Aid from your computer is using legitimate anti-malware software. We recommend using SpyHunter or STOPzilla. Both work just fine. This entry was posted on 2012-06-07 at 02:56 and is filed under Rogue Anti-Spyware, Viruses. You can quickly scan the QR code with your mobile device and have Windows PC Aid manual removal instructions right in your pocket. How did you remove Windows PC Aid?